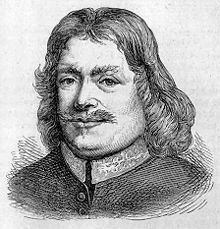 Ioannes Bunyan (Elstow iuxta Bedfordiam natus die 28 Novembris 1628; Londinii mortuus die 31 Augusti 1688) fuit baptista et scriptor Anglicus. 1659. The Doctrine of the Law and Grace Unfolded. 1666. Grace abounding to the Chief of Sinners. Autobiographia. 1678–1684. The pilgrim's progress from this world to that which is to come. 2 vol. 1680. Life and Death of Mr. Badman. Hill, Christopher. 1988. A Turbulent, Seditious, and Factious People: John Bunyan and His Church. Oxoniae & Novi Eboraci. ISBN 0-19-812818-5. ↑ RGG, III. Band, Artikel Baptisten, I,2 (Spalte 863). Novissima mutatio die 15 Octobris 2014 hora 13:46 facta.